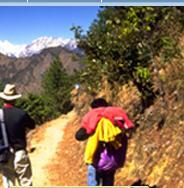 2Nights/3Days Chisopani/ Nagarkot/ Tea house Trekking. Day 01 Drive to Sundarijal by private car (1:00 hour) trek to Chisopani (4 hours 2340 mtrs) over night at lodge. Day 02 Take a breakfast and Trek to Nagarkot (1920 mtr. 6/7 hours walking) over night at lodge. Day 03 Trek to Changunarayan (2/3 hours walking) and drive back to Kathmandu by a private car (1 hour driving). Transfer to selected hotel.